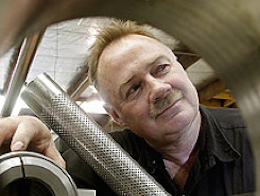 Malcolm Sanderson’s Petone based company Sanpro Industries, builds the most efficient muffler making machine in the world. It’s a David and Goliath story, we have beaten the big international manufacturers and export to 30 countries. The Sanderson TPM machine, has attracted the attention of the world’s fifth largest automotive supplier, French based Faurecia Emissions Technology Faurecia equip 25% of new vehicle’s on the planet. Faurecia’s head of special projects worldwide Randall Sprow explains: “Faurecia engineers regarded Sanpro as the Global Standard. They build the best! Sanpro spend so much on R&D. This year’s machine is 60% more efficient than last years. We intend to purchase around 100 machines over the next 5 years to equip plants in Czech Republic, India, South Africa and Brazil. Worth over $25 million." Original generation time 6.3268 seconds. Cache Loaded in: 0.0452 seconds.